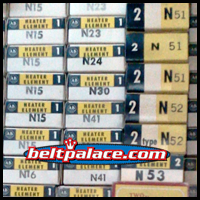 "N" and "NN" Heater Element. N Series Motor Starter Heater and Starter Switches. Home > CLEARANCE > "N" and "NN" Heater Element. N Series Motor Starter Heater and Starter Switches. *Find your starter Number ABOVE (eg. N15) and contact us to order. Stock is getting very low and availability is limited. We only have a few left of each size.